I don’t especially want to think of Eden Studios’ Buffy the Vampire Slayer as an old role-playing game, but the game is more than ten years old now, it’s out of print — though not circulation, by some miracle of licensing — and the Buffy property seems to have become passé with the young peoples. But my loyalty for the game as a workhorse for whatever I want to run is indefatigable. I used it for a BPRD scenario when I first began running games at conventions, layered in elements for Scions of Time, and then recently switched over to using Buffy for my Ghostbusters games at Carnage. And during the playtest of Post-Diluvian Predators of Rochester, certain players snickered at the informal style of the writing, and its apparent lack of tables, so that’s where my sense that the game’s line into the gaming culture zeitgeist sunset some time ago. Buffy the Vampire Slayer, and its siblings Angel and Army of Darkness, has a few key qualities that keep me coming back to it as the engine to run my scenarios. First is ease of play. Like its classic Unisystem cousins, Buffy uses a single d10 plus skill and ability for most questions of resolution. On the GM’s side, it gets even easier: most non-player characters are rendered as a series of target numbers for the players to roll against. If you’re juggling multiple creatures with weird abilities, and trying to keep in mind the state of everyone else in the fray, not having to worry about rolling dice or adding up numbers correctly is huge. Cinematic Unisystem delegates that work to the players, and really, they were going to roll dice anyway. Why make the GM roll too, when you can get mostly the same result with a pre-calculated target number? Secondly, it’s super easy to adapt material to fit a preexisting idea, or come up with something new. Buffy and Angel both have guidelines for roughing out new monsters for players to beat up. If that’s not enough, I can flip through WitchCraft books for more concepts already rendered in Unisystem terms. I did that with Post-Diluvian Predators, as well, actually, pulling some “Vampyre” abilities from Mystery Codex to simulate a variant I found in Night’s Black Agents that I wanted to be the default vampire type in my Ghostbusters world. Thirdly, Buffy‘s Drama Points are something I wish more games offered. I get that the whole point of the dice is to introduce change and risk. But there should be room to stretch when a character is exceptionally motivated to succeed. Drama Points provide that stretch. I think maybe they’re too plentiful in a convention game — everyone could probably do with a fifth of what a starting character gets for Drama Points — but as long as they’re in short supply, players will value them as a resource to ensure that what they want to happen, will. If you’re curious about Buffy the Vampire Slayer or Cinematic Unisystem, check out the original quickstart, which is still available courtesy the BBC. The Cthulhu Mythos of H.P. 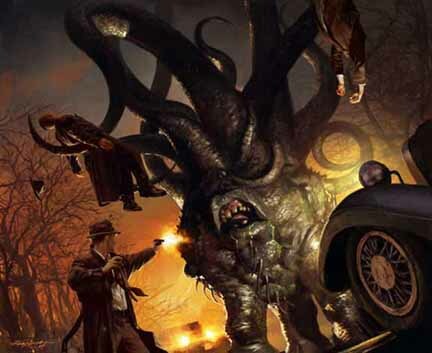 Lovecraft, or Cthunisystem for short, brings some of the classic elements of Call of Cthulhu role-playing to Cinematic Unisystem. Compiled by Salvatore Cucinotta and Jason Vey, it’s a great resource for adding mythos monsters and a different flavor of spell to your Unisystem games. By default, it’s written for Cinematic Unisystem games like Buffy the Vampire Slayer and Angel, but it’s super easy to use the monster quicksheets with classic Unisystem rules, or extrapolate backward to a full stat block. Shave off any Drama Points the creature may have and call it good. After struggling with a non-starter of a plot seed for some time now — slasher movie characters coming to life during a horror film convention, I think I finally got something I can work with for Carnage, thanks to a poster at RPG.net who shared his own idea for a one-shot Ghostbusters game. My take’s already going in a different direction because I’m still trying to accomplish some of the things that I wanted to do with the slasher concept, but there are some core elements that will carry over. Not that knowing that will save any potential players who scour that thread for clues. Bwa ha ha. So I went to Muddy Waters tonight for a writing session. I hadn’t necessarily planned on making it a Ghostbusters session, but I think I got more done in that Open Office document than I did filling out the Broken Spokes wiki. Some story elements and characters popped into my head that I never could have expected. This might be what fiction writers refer to as their characters telling them what happens next. As it stands, I have a much better grasp of what to shape this into, but it’s not quite there yet. Material I wrote tonight doesn’t line up with my goals. I could ditch the goals and follow the material as it inspires me, but it’s leading me in a direction I’ve already gone. I want to do something different this year. Right now, there’s an element linking back to one of the original ghost hunters of modern fiction. The Wikipedia article teaches me it really makes no sense as such in the context I want to use it, so I think I’m going to end up inventing my own substitute, who can be modified to fit appropriately. But the inspiration’s still there. I’ll tell you all about it after the convention in November. I’m not sure if I want to stick with GURPS for this and future Ghostbusters games. Having had time to think about it, I wasn’t taken away the representation of proton packs and ghost traps. Basically it’s more fiddly math on my part than I necessarily want to do. I also don’t think it’s necessarily fun for the players. They basically spend turns maintaining their streams until the ghost is contained. So the choices seem to be make everything else so entertaining that busting ghosts is a dreary, but necessary part of a ridiculous job, or mechanically spice up the zap ‘n trap part of things. I’m struck by the thought there should be an option for going “full stream,” whatever that might be — probably extra damage or an instant containment field with a risk of catastrophic malfunction or power burn-out. But are those interesting problems? They essentially take away the player’s single really useful tool for a random period of time. Looking back at Lurker in the Limelight, most of the fun at the table came not from busting ghosts, but character interaction and riffing on the absurdities of entrepreneurial spectral extermination. The system I would most likely switch to, Cinematic Unisystem, wouldn’t really make a difference in that regard, as both it and GURPS are pretty traditional in what their mechanics represent in the game world. I’ll think about it more. I have a month or so before I have to submit anything for the convention book. Last week, Carnage‘s new website went live, unofficially marking off the countdown to the convention’s thirteenth gathering in November. That can seem like a long way off in April, but I appreciate the head’s up. I’m a poky writer at the best of times; combining that with the desire to playtest adventures beforehand can get hairy. But I’ve already given some thought to what I want to run, including adventure particulars. In keeping with the horror theme, I plan to run a GURPS game using Kenneth Hite’s Cabal universe, as well as a return to the Boston franchise of Ghostbusters International, which went so well last year — still up in the air whether I want to go GURPS again or switch to Cinematic Unisystem. Beyond that, I’m not sure what to run, as I’ve climbed on board the good ship Carnage as staff. There will still be lots of running around this year, except now it will be with purpose. Working as staff is fun and something I tend towards naturally, but it does put a crimp in one’s ability to run games. I hope to squeeze in at least a game of Arkham Horror somewhere along the way. Last year’s session was sparsely attended, but I’m not sure if that was the Saturday night time slot or the myriad viruses that flew thick and heavy. If last year’s convention “flu by,” then 2010 will be the Year of the Antibacterial Wipe, I think. Over on Examiner.com, Michael Tresca, himself author of Who Ya Gonna Call?, posted a rundown of Ghostbusters‘ influence on gaming through years. 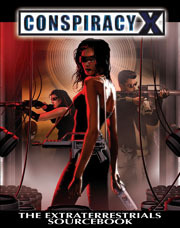 It directly spawned two editions of an RPG itself and a number of homages and imitators, including miniatures sets and InSpectres. There are, however, a few takes on the concept Michael left out of his article, some of which I found helpful in preparing The Lurker in the Limelight for Carnage. David Goodner wrote up an entire PDF on catching ghosts in Cinematic Unisystem by the name of Spook Stoppers. It’s got all the essential widgets a ghostbuster could want, some sample characters and outlines on creating ghosts, with still more samples to use. It’s a great starting point for anyone for whom Cinematic Unisystem is their system of choice. You’ll find another take on busting heads in a spiritual sense with the Cinematic Unisystem over at Morgan’s Unisystem page. In the anthology supplement GURPS All-Star Jam 2004, Ken Hite’s contribution was the article Ghost-breaking. It takes a more antiquated approach to spook hunting, with electric pentacles and other wondrous ghostbusting artifacts, but it’s got a widget you haul around on your back to zap and trap ghosts, so that counts in my book. Ranging further afield, we have Octavirate Games’ take on spook and monster hunting, ExorSystems, Inc. It’s a d20 Modern supplement that sounds like it plays up the humorous side of exterminating supernatural pests while working for a major corporation. I say “sounds like” because I opted not to buy this one on the grounds I already have too many PDFs I have yet to read. This one never made it to market, sadly. as Daring Entertainment announced in early September 2009 it was ceasing publishing on account of the current economy. Ecto Hunters was pitched as part of the Daring Action Block, a series of PDFs for Savage Worlds describing the series in a cartoon programming block, alongside “shows” with strong similarities to nostalgia properties like G.I. Joe and Transformers. However, at least one of Daring Entertainment’s properties, Hard Boiled, may still see publication, which leaves a glimmer of hope for Ecto Hunters as well.